Organizing amazing adventures at UH! 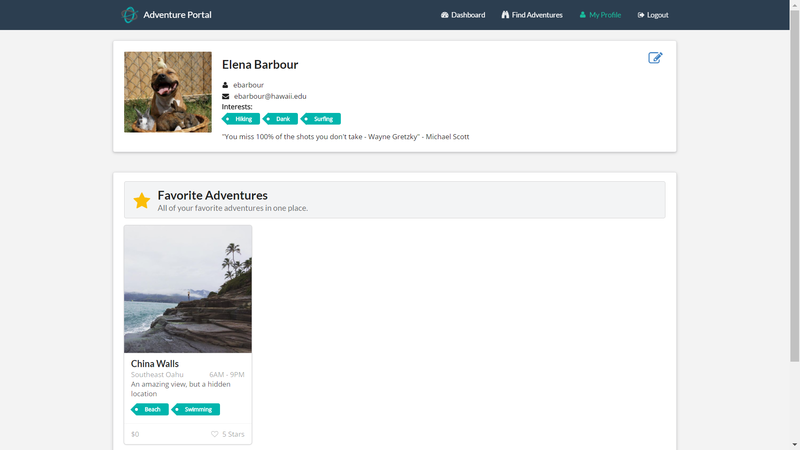 Adventure Portal is an application for connecting shared interests with the right people. 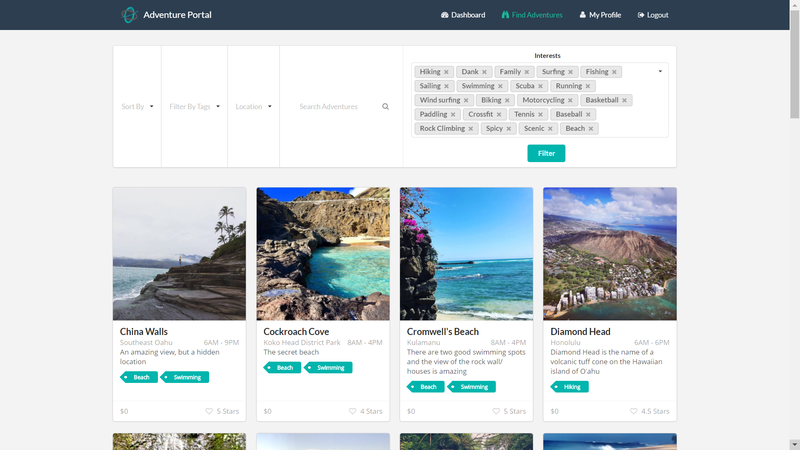 Adventure Portal is a tool built by students at the University of Hawaii to help members of the UH community with find exciting adventures to embark on and organize activities with similar minded people. Have an awesome hangout spot that would be perfect on the weekends? Want to share your best getaway activity? Or do you just want to explore and find something new with other students who just want to do the same? Let Adventure Portal help you explore your interests and help you embark on your next adventure. Logged out users are presented with information about Adventure Portal and are unable to view featured activities until the user logs in. The user can log in by selecting the “login” link on the top right of the navigation bar. After logging in, the user’s dashboard with recent/popular activities and upcoming events are displayed as these suggestions are based on the interests listed in the user’s profile. 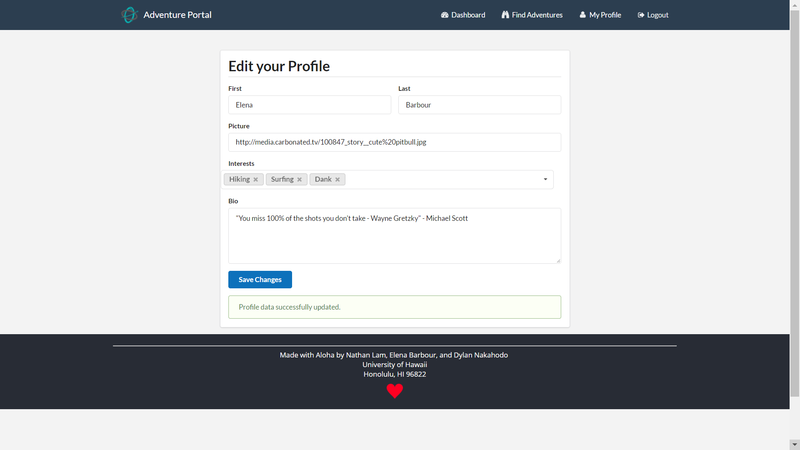 For a new user with no added activities, the Portal will ask the user to update his/her interests in order to present similar related activities. 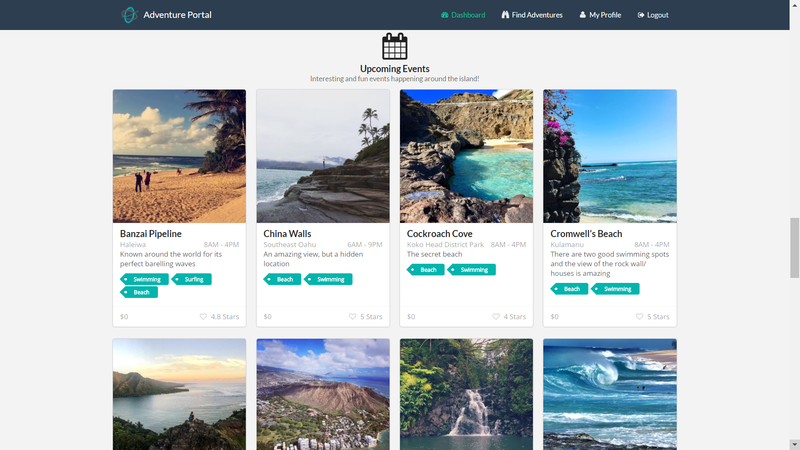 Users can find new adventures created by the community and sort by the most popular or upcoming events. In additions, filters such as highest rated, interest tags, and activity location allow users to quickly search community favorites. Users are able to pin and favorite adventures that interest them which will be saved to their dashboard. 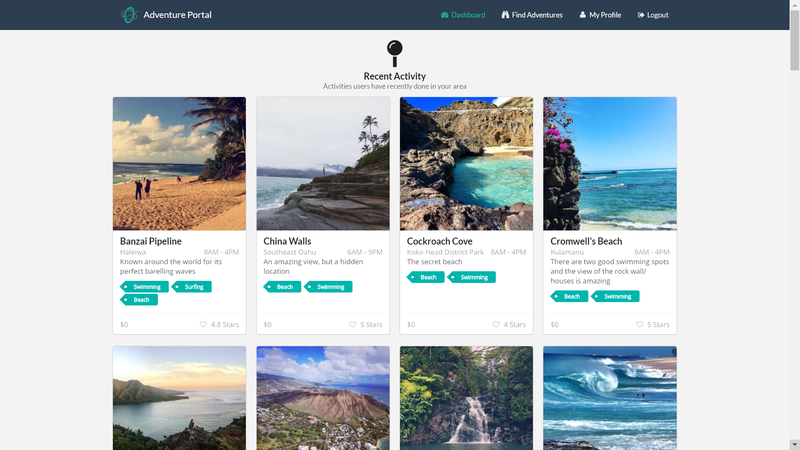 Users can add their own adventures to share with the community! Your profile page is where you can write your bio, list your interests, and view your pinned/favorited activities. You should make sure to edit your interests to make discovering new adventures easier! In case the user tries to navigate anywhere without signing in or lacking authorization. Sometimes you want to “accidently” go into another user’s personal space. Sorry, we don’t allow that! But don’t worry, we’ll directly you back safely! In case the user navigates to a nonexistent url. We all get lost at times. No worries, you can safely teleport back home! To begin working on Adventure Portal, Meteor must be installed on your machine. Test that Adventure Portal is running on localhost:3000 from any browser. If you have an account on the UH test CAS server, you can login. Note: It may take some time to build the project and start up the application after running the commands. 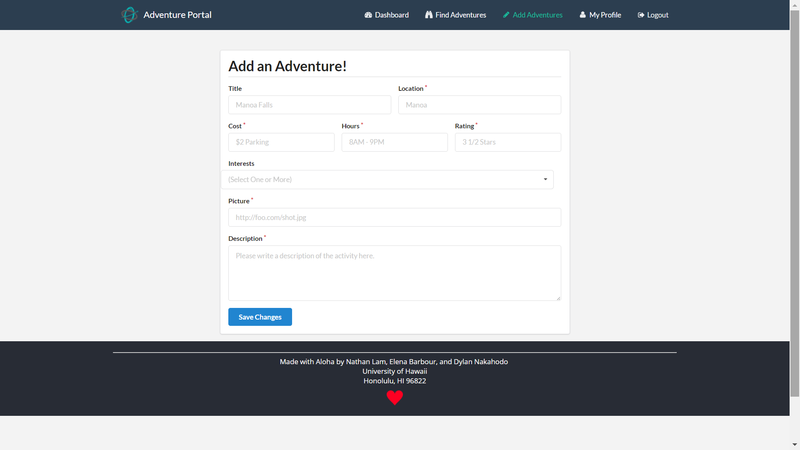 From here, you can use the editor of your choice to begin modifying Adventure Portal’s files. Note that Adventure Portal uses the coding style preferences described by this xml file. To get an idea of the project structure, it is helpful to note that Adventure Portal is based on the meteor-application-template available here. 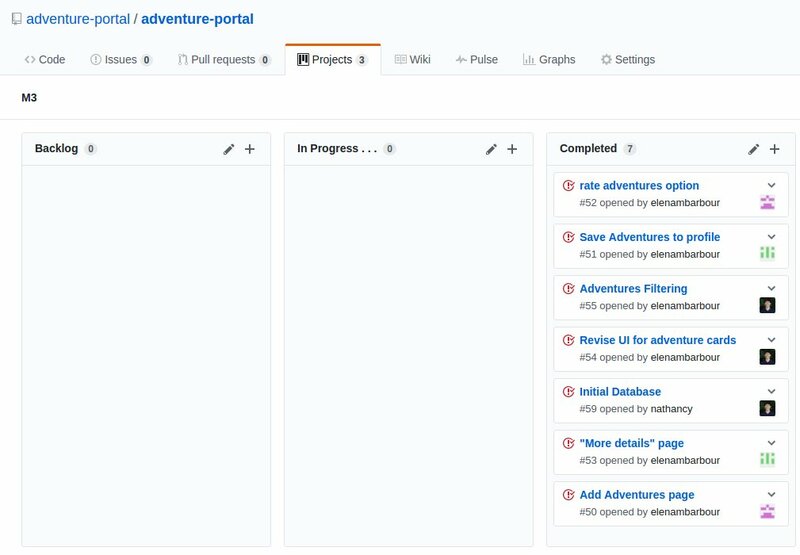 The development process for Adventure Portal consisted of a sequence of milestones which included issues corresponding to 2-3 day tasks. GitHub projects were used to manage the processing of tasks during a milestone. 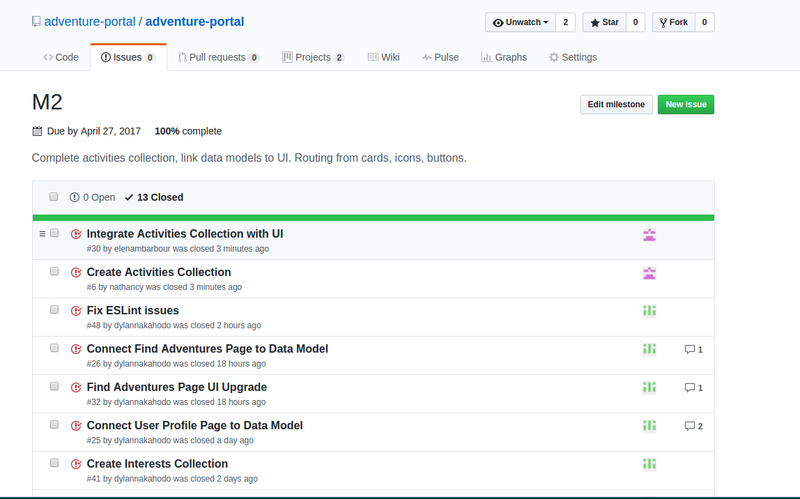 The following sections document the development history of Adventure Portal. The objective was to complete minimum viable product development of Adventure Portal. Milestone 1 was completed on April 13, 2017. The goal of Milestone 1 was to create a set of HTML pages providing a mockup of the pages in the system. Each page was developed as a template and FlowRouter was used to implement routing to the pages. For login authorization using the University of Hawaii test CAS system, templates from meteor-example-uh were used to guide the implementation. Adventure Portal allows anyone with a UH account to access the system. In addition, authorization was implemented such that users cannot access the profile or filter page associated with another user. The objective was to implement data collections to hold user profiles/activities, dynamic routing, and UI upgrades. Milestone 2 was completed on April 27, 2017. The objective of Milestone 3 is to implement a saving feature so users can save their favorite adventures, connect the user’s favorite activities from the data model to display on their profile, and also to add a page that will allow user’s to add their own adventures. More work will be done on the UI as well. Milestone 3 will begin on April 27, 2017 and will end on May 9, 2017. We surveyed five members of the UH community. We gathered feedback by asking the test users to perform the tasks of adding, editing, and saving an activity, filtering through activities, and browsing through adventures to see if there were any points of confusion along the way. We had the following people test the application.